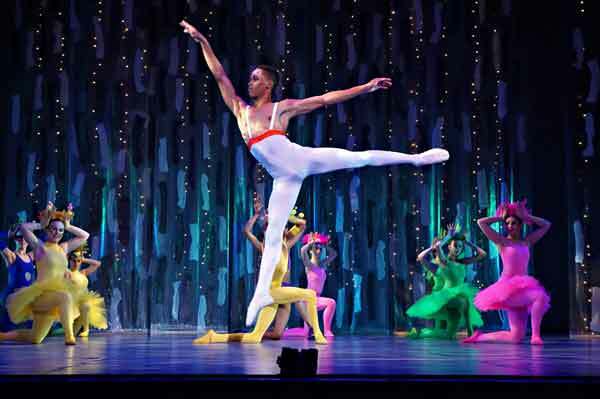 Presented by the Johannesburg Youth Ballet, A Midsummer Night’s Dream which is currently appearing on the National Arts Festival’s Main Programme, is a pure delight. It was first performed last year in October in Johannesburg. This production features guest dancers from Cape Town City Ballet, Casey Swales, Rachel Abrahams, Fanelo Ndweni and Thato Nkwe. Now based in Johannesburg, Hawkins is well-known in KZN as the Artistic Director of the former Playhouse Dance Company and founder of Fantastic Flying Fish Dance Company. His work is always innovative, clever – often off-the-wall - and filled with humour. This production is no different. Putting in great performances as Oberon and Titania were Casey Swales and Rachel Abrahams originally from Durban. Another KZN connection was Marc Kay and Mthokozisi Zulu who provided much humour as two of the Actors. Special mention must be made of Leela-Lind Devar and Thato Nkwe who played Hermia and Lysander as well as Robyn Jordaan and Armand van der Merwe as Helena and Demetrius. Fanelo Ndweni was a suitably cheeky and energetic Puck, spreading magic flower juice into the wrong people’s eyes and creating chaos in the process! The Actors are given a new slant. They are on their way to perform a great Welcome Back concert to do the story of Pyramus and Thisbe but suddenly find that their vehicle has been “affirmatively borrowed” with three of their actors in it. They are stranded in the forest and now have to rethink the play with half the cast. The dialogue was scripted and workshopped by the actors and made for some hilarious moments. Tshepiso Mashego, as the third Actor, provided a hilarious slant on the wall’s “chink”. The corps de ballet was made up of young members of the Johannesburg Youth Ballet and there is certainly much talent in this company which celebrates its 40th anniversary this year.